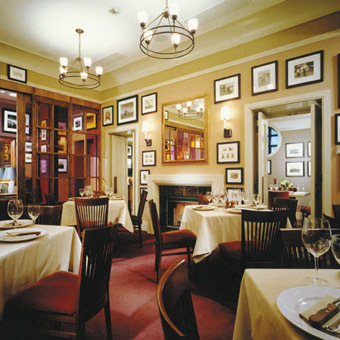 In addition to their magnificent restaurant, Tellers Chophouse offers outstanding banquet services. The Gallery (top), a private room studded with vintage photographs capturing Long Island’s past, is a superb choice for parties, meetings and other special occasions. The Board Room (middle left) impresses with circular windows, velour seats and a double sided fireplace. This intimate space can be closed off or opened to adjoin The Gallery for larger events. The Gold Room (middle right), a handsome bar and neighboring lounge (bottom), boasts stunning wood-paneled walls cut from exotic anagre trees hung with vintage pictures of the Bohlsen family and turn of the century restaurants. Luxuriate in fine leather chairs and banquettes or find a seat at the custom copper bar.